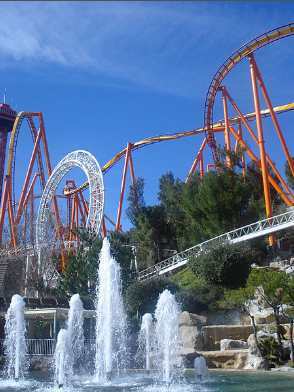 Magic Mountain Six Flags CA is a top thrill seeking roller coaster theme park in Southern California. It is located just north of Los Angeles, about 150 miles from downtown San Diego. If you love roller coasters, this is the best high speed roller coaster theme park in California. Next door is the seasonal Hurricane Harbor Water Park. Every time we drive between Northern California and Southern California, we drive right past Six Flags Magic Mountain, which is easily visible from the freeway Interstate 5. This makes a great stop on a California vacation, or a day trip from southern California - San Diego, Los Angeles or Orange County. Kids under 48" tall get into Magic Mountain CA at a discount for a reason - they miss out on some of the awesome rides. Tip - if your child is close to the height limit, have them wear shoes with thick soles to give them that extra 1" of height. While there are many kids and family attractions too, serious roller coaster enthusiasts come to Magic Mountain CA for the best rides. Head to the most popular rides first to avoid the long lines! Twisted Colossus - claims to be the longest hybrid rollercoaster in the world, with both wooden and metal sections. Experience the thrill of the Top Gun Stall, High Five and Zero G for a 4 minute ride over 5000 feet of track. The New Revolution Galactic Attack - enjoy a virtual reality experience as you are under attack from flying drones while experiencing a thrilling VR coaster ride. JUSTICE LEAGUE: Battle for Metropolis - opening in summer 2017, is an interactive 3-D indoor dark ride with laser-gun game play. Full Throttle - Enjoy a 160 foot loop on both the inside and outside of the track! Minimum height 54". Scream - The name says it all. 65 mph on this Six Flags roller coaster with no floor. Riders must be 54" or taller. BATMAN The Ride - Enjoy the thrill on the Batman roller coaster ride with some Batman movie magic. Minimum height 54" tall. Tatsu - Six Flags Magic Mountain claims this is the tallest, fastest and longest flying roller coaster on planet Earth. Check it out if you are at least 54" tall. Viper - 7 head over heel inversions on the Viper Six Flags roller coaster. Another ride for those 54" and taller. The RIDDLER'S Revenge - This another fast ride at Magic Mountain - the world's tallest and fastest standup roller coaster ride. 54" height minimum. Green Lantern First Flight - You don't have to remember the Green Lantern comic series to enjoy the first spinning coaster in the U.S. But you must be a fearless super hero, so bring your Green Lantern Power Ring and overcome your fear. Riders must be 52" Green Lanterns or taller. Apocalypse - A thrilling Magic Mountain wooden roller coaster. Minimum height 48" tall. Dive Devil - For an additional fee, you can try sky diving without a parachute from 15 stories up. Must be 48" or taller. Gold Rusher - A runaway roller coaster ride for those 48" or taller. And more ... this list is not complete! Six Flags CA also offers many family and kids rides for the younger thrill seekers. You may also enjoy the seasonal water park next door - Six Flags CA Hurricane Harbor Water Park. 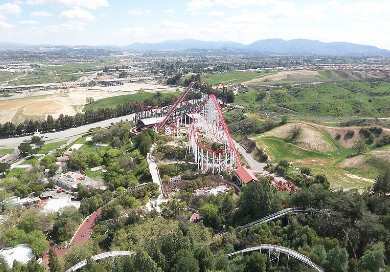 Six Flags Magic Mountain tickets can be expensive when you buy them full-price at the gate, but there are a number of ways to get discounts for your California vacation. So Cal Theme Park Package - If you are visiting multiple theme parks in southern California such as Universal Studios Hollywood, Knotts Berry Farms or Legoland, you can save money. Check out our page comparing the deals for the theme parks in Southern California. Hotel Discount Tickets - If you are staying at a hotel near Six Flags Magic Mountain CA, you can get some great ticket discounts as part of your hotel package. Six Flags Coupons - Six Flags partners with other brands such as Coke to offer discounts. See coupons on selected cans of Coke, or enter promo code "Coke" on the Six Flags website (last offer was to save $20 off regular ticket prices). Advance Purchase Discounts - Six Flags offers discount tickets when purchasing online in advance. Season Passes - Locals love the season passes as you can go as many times as you want for a great price. Two Park Pass - Stay an extra day and visit both Six Flags Magic Mountain and the water park right next door - Six Flags Hurricane Harbor. Where is Six Flags Magic Mountain? - Six Flags theme park is located north of Los Angeles CA, at the Magic Mountain Parkway exit off Interstate 5 in Valencia. It is located about 27 miles north of Universal Studios Hollywood, 61 miles north of Disneyland Anaheim CA, and 150 miles north of San Diego California. Directions to Six Flags Magic Mountain - From Interstate 5 north of Los Angeles, exit at Magic Mountain Parkway and head west. Proceed along Magic Mountain Parkway to the park entrances.